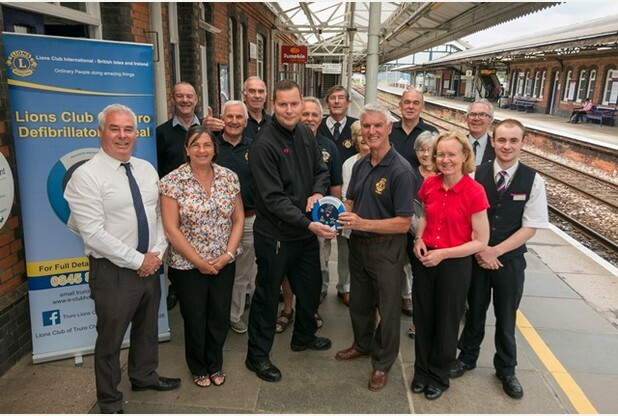 The group with the tenth lifesaving device at Truro’s railway station. This AED was made possible in part by a campaign launched by the Truro Lions Club and the Ronnie Richards Memorial Charity two years ago that called for placement of AEDs in as many local public areas as possible. Since the program’s inception, 10 AEDs have been installed that cover populous areas, including the Hall For Cornwall, Truro Tourist Information Centre, and Truro Cathedral. The club has far exceeded its original target of five AEDs and plans on installing an additional eight AEDs in the near future. SCA is a condition in which the heart suddenly and unexpectedly stops beating, causing blood to stop flowing to the brain and other vital organs. SCA happens to people of all ages, including children, and is often fatal if not treated within minutes. It claims more than seven million lives annually.